It’s that time of year when it seems traditional to consider the ways you failed last year and to make resolutions so that you can establish a new pattern of failure early next year. I’ve already noticed a few blogs like that. The way I get round this is simply to look at my targets, and if I’m not meeting them I adjust them to meet reality. For instance, when we closed down for Christmas I set myself the target of writing my 300th post before the end of the year. That’s now. This is the 296th post. I just set a new target, to write 296 posts before the end of the year, and am currently basking in the warmth that comes from the satisfaction of meeting a target. In truth it wasn’t an important target and I’d have been better not putting pressure on myself. That’s what we need to remember – most stuff isn’t important. Looking back on the year it’s pretty certain that you did what was important and that what didn’t get done wasn’t important, though it seemed so at the time. I’ll leave it here, as one of my targets is to avoid being maudlin at New Year, so I’ll finish with a song that sums up my approach. This entry was posted in Care Farm, Uncategorized and tagged New Year on December 31, 2015 by quercuscommunity. Ah well, back to work. Christmas has come and gone, I have caught up with my sleep, experimented with sloth and gluttony, moaned about the poor quality of TV and finally managed to get my new lap top working. I’ve spent a year working on a netbook at home and a museum piece at work so it’s a pleasant change to work on something that doesn’t have to keep stopping to catch its breath. The downside is that I will now be expected to produce a lot more work. 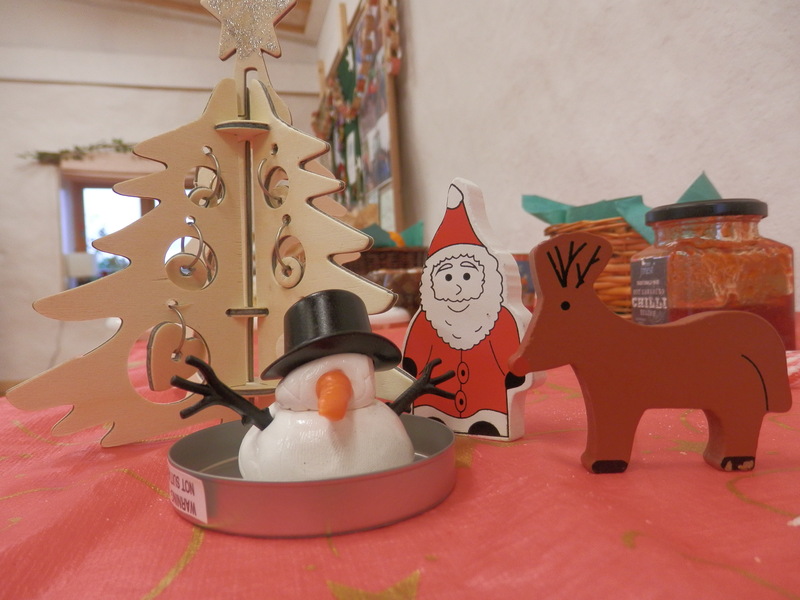 These are some photographs from a Christmas novelty we bought – it’s a special putty that allows you to make a snowman body, add plastic accessories and then watch it “melt” before doing it all again. It isn’t quite the right time for it but if I don’t use the photos now it will be another 50 weeks before I can use them. 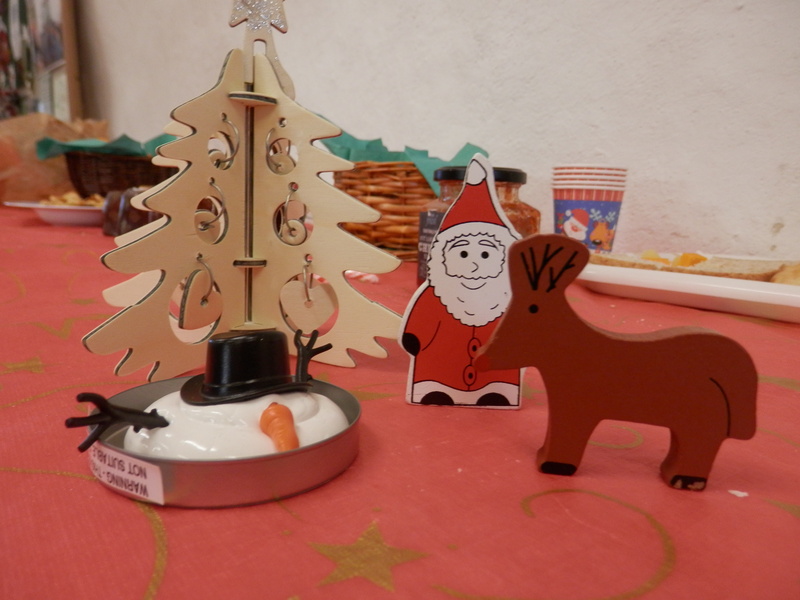 This entry was posted in Care Farm and tagged Christmas, New Year, resolutions, snowman on December 31, 2015 by quercuscommunity. The sandwiches are now just a pile of crumbs and a memory. The pineapple on sticks recipe can be rested for 12 months. The Monday party is over. And now it’s just four sleeps until Christmas. My team, thanks more to cheating than skill, came second in the Indoor Beach Volleyball game 21-20. It was hard work keeping it that close to ensure a cliff-hanger ending. Fortunately nobody noticed that we were sneaking in some movement coaching, so they carried on enjoying themselves. This time I checked that we all started with the same number of tiles, and the matches were more even, but I still ended up losing. I suspect there’s some sort of Rain Man effect going on and I’m coming out on the losing side! I did the shopping at the weekend. The big session was at 10.30 pm on Saturday night. The final session was on Sunday afternoon when I topped up with the bits I’d forgotten the night before. Apart from a few veg and some bread I now need nothing more. It’s the most relaxed I’ve ever been at Christmas, and all done without a list or a plan. As long as Amazon stick to their promises I have even done all my shopping for presents. I nearly came unstuck on the cheese footballs, which are a family Christmas tradition. We’ve had 27 Christmases and each one has been accompanied by cheese footballs – a favourite from Julia’s childhood. I couldn’t find them in the crisp aisle, and I couldn’t find them with savoury biscuits. For a moment it looked like , having neglected to buy them in September, I was doomed to be a tradition-breaker! A fellow searcher. lamenting to her husband that she didn’t know where the find Twiglets (a snack possessing considerably less charm than the synthetic orange cheese footballs, jogged my memory). Not crisps, not snacks, not savoury, but seasonal! However, back to Monday. 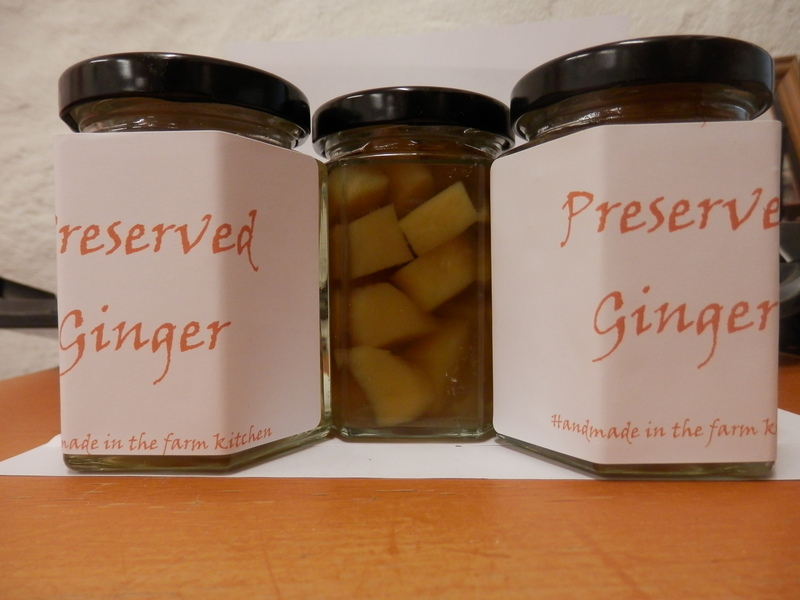 The preserved ginger is labelled ready to be given as presents. We’re washing up and, once Julia has her next night shift out of the way we’re actually going to have a week’s holiday. It is now, as the title says, the final countdown to Christmas. This entry was posted in Uncategorized on December 21, 2015 by quercuscommunity. Further to the last post I’m happy to report that I managed to find two bottles of Sloe Vodka left over from previous years – one is a delicate pink from last year and the other, from three years ago, has taken on the red/brown colour of old port. I don’t think it has matured in the bottle – just that the older sample was darker and less well filtered to start with. I have also done four hours research (I use the term loosely – it was the internet) and I am now a sloe expert. Strangely, when looking for words to describe my newly self-declared status, it was a bit of a struggle. There’s something immodest about calling yourself an expert (even in jest). The words that come to mind are mainly from other languages – fundi, guru and maven all spring to mind. I should probably reflect on this meaning that we Brits are a modest race, but I’m sure there are other, better qualified people to do this. Talking of business cliches how about this – “allocating budget to a delivery structure”. It’s a lot of words that mean “do things” whilst pretending that we have (a) a budget and (b) a “delivery structure”. It has inspired me to start a list of such things. So, here I am, an expert. I now know that the best way to make sloe gin. You use cheap gin, or expensive gin. You add sloes that have been picked after the first frost, picked in late summer, frozen, pricked or bashed. Then you add no sugar, some sugar, half the sugar or lots of sugar – because you don’t need lots of sugar or can always add some later (in the form of sugar or syrup). See – all you need to know about sloe gin – written by experts, people who have been doing it 50 years, people with chemistry degrees, winemakers and people who have just started making it but have read about it on the internet. You now know as much as I do, but didn’t have to spend four hours doing it! All you need to decide now is whether to prick the sloes with a thorn from the tree, a silver pin, an ordinary pin, a fork or a device made from cork and multiple pins. Oh, and you need a position on osmosis. Now you’ve read all that send me a fiver and I’ll send you a certificate to print out. Or you can come down to the farm next September to attend our Sloe Gin workshop (yes, I’m serious – putting it together now). Got to go now – sandwiches to make. This entry was posted in Care Farm, Foraging and tagged expert, foraging course, sloe gin, sloe vodka on December 21, 2015 by quercuscommunity. Thursday went by in a flash and Friday wasn’t much better, so it’s now Saturday and this is another of those catch-up posts. First photo is a night shot of the Christmas tree and fountains at Sneinton Market. Technically it isn’t great but it has the tree and fountains and I thought I’d be a bit festive. The rest of the time, when I haven’t been catching up on my reading of other blogs, has been taken up with parties, Men in Sheds, sloe gin, sloe sherry, looking up recipes, tidying cupboards and procrastination. The sloe gin is looking a bit light, though it often does in photographs, but is tasting OK. I’m also making sloe sherry this year, a drink I didn’t know existed until a couple of months ago. After bottling the gin I put the sloes back in the bottle and covered them in a bottle of Sainsbury’s sherry. Yes, it’s that simple. The choice of sherry took more time than the “making”. In two months I expect to have a dark, sloe flavoured drink that is also good added to stews and gravies. I say “expect” but as yet I have no personal experience. For £5.50 it’s a gamble worth taking. Meanwhile the “shed” is making progress. We now have the skeleton of a vestibule, so the wind won’t be so much of a problem from now on. We also have the stud work up for a wall to shelter us from wind from the back door. Yesterday we sited the chalk crosses on the walls where our new sockets are going to be fitted, so things are looking up. At the moment we’re using just two sockets and a rat’s nest of extension leads, which is, to put it mildly, a practical and Health and Safety nightmare. Imagine that you are working on the lathe when someone wants to plug the kettle in. It’s rare we manage this without either the lathe going off or one of the lights going out. Two more donated filing cabinets were delivered yesterday (meaning we have more and better cabinets in the shed than we do in the office). By the time we come back in January it will be a lot better from so many points of view. This entry was posted in Care Farm, Foraging and tagged blackthorn, sherry, sloe on December 19, 2015 by quercuscommunity. This year we opted for one party and a much shorter guest list. It wasn’t that we weren’t grateful to the people who help – just that we are finding ourselves very short of time. Instead of spending hours on planning and preparation I rolled up outside out local Sainbury’s at 7.55 am (five minutes before it opened) and was out again 40 minutes later with the party food in two bags. As an aside here, am I the only one who finds shop “opening” hours a little annoying? If they advertise that they are open at 8am shouldn’t you be able to get to all the shelves instead of dodging round various staff and trollies involved in re-stocking? Just a small gripe, but a major annoyance when you’re trying for a quick charge round the shop. I have some sympathy with the shops that open on Monday morning and close at midnight on Saturday – they don’t have much choice. But if you open from 8 until 8 you have 12 hours to restock, so why are your staff in my way? It took just over two hours to make salads and sandwiches and nobody complained that most of the food was bought in. It’s obviously the way to go as I felt much more relaxed them normal and had plenty of energy for the game of Indoor Beach Volleyball. We had a giant balloon for a ball, a table for a net and various “local rules” regarding tables of food, slipping on coleslaw and taking telephone orders for turkeys in the middle of a set. Safeguarding officers, Health and Safety Officials and the governing body of Official Beach Volleyball would all have had a fit if they could have seen us. I ended up with two yellow cards and a sprained finger, though I still say that asking the referee “What kind of idiot are you, sir?” is merely soliciting an opinion from the match official, not offering abuse. 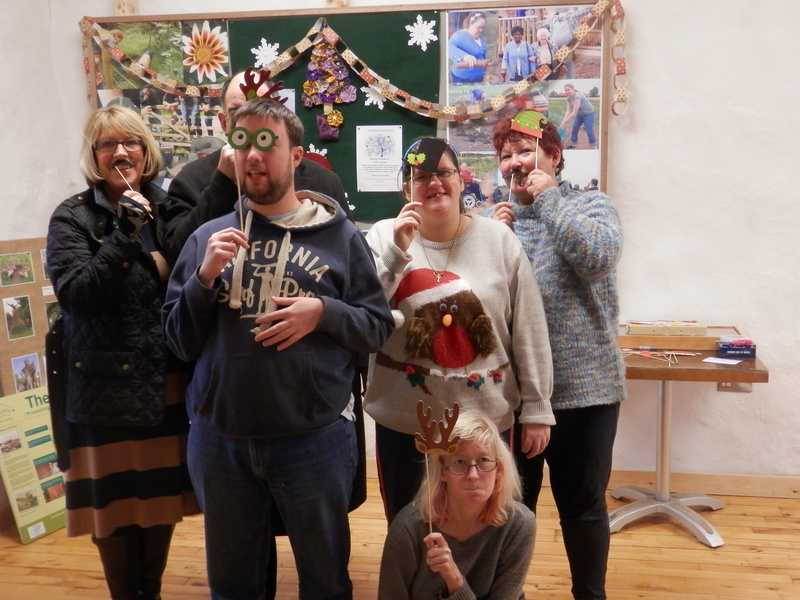 We also did the more traditional stuff too – carols, karaoke, bad jokes, pass the parcel and board games. Tomorrow I’ve been invited to a fuddle. That’s a meal where you all take something to eat, like a potluck supper. It’s not a word I’m familiar with and in my family it’s a Jacob’s Join. We talk about the British and the Americans being separated by a common language, but sometimes the English are just as bad. On Friday it’s Men in Sheds. Saturday I’ve been landed with command of the kitchen. Monday we have Party Part II for the people who don’t come on Wednesdays. Then, with my stomach crying out for plan food and Christmas only days away, I will start to plan the Christmas Dinner. This entry was posted in Care Farm and tagged Christmas, Christnmas party, language on December 16, 2015 by quercuscommunity. I’ve not been about much the past few days because I needed a rest after the cookery and because I have been catching up with my Amazon reviews. I have a habit of “buying” free whodunnits for my Kindle and as a result I have a backlog- partly because they are quicker to buy than to read, and partly because I can’t read many at a time. They are generally squeaky clean American women in their 20s or 30s with successful businesses in lovely American small towns, often in Maine. Jessica Fletcher has a lot to answer for. If you read too many of them I swear you run the risk of becoming diabetic. I’ve managed a couple of serious reviews though and one of them is on the Book Review page – The Wild Life: A year of living on Wild Food by John Lewis-Stempe – author of Meadowland. I think it’s a bit better than Meadowland and a bit more realistic. He spends a year living on food he forages from his 40 acre holding in Herefordshire. That’s rabbit, pigeon, pheasant and green salad. Yes, salad every day. Anyway, go to the review page if you want a look. There will be a few more appearing soon, though with the Quercus Christmas Party tomorrow it might not be for a day or two. I will also get a photo up. This entry was posted in Book Review, Care Farm and tagged books, John Lewis-Stempe on December 15, 2015 by quercuscommunity.